Each year the Lakeshore Nature Preserve awards several Student Engagement Grants of up to $1000 each to facilitate the use of the Preserve as a resource for education among UW undergraduates. Any student, faculty, or staff member at the UW-Madison may apply. Groups of individuals may submit a proposal as a team. Every individual or team must have at least one faculty or staff member, who is expected to play an active role in overseeing the project. This funding opportunity is made possible by the Academic Endowment Fund of the Preserve, established by former UW faculty member Robert M. Goodman and the late Professor Henry Hart. To contribute to the Academic Fund to create more opportunities for undergraduates to engage in learning in the Preserve, please contact the Preserve Program Manager at laura.wyatt@wisc.edu or 608-265-9275. 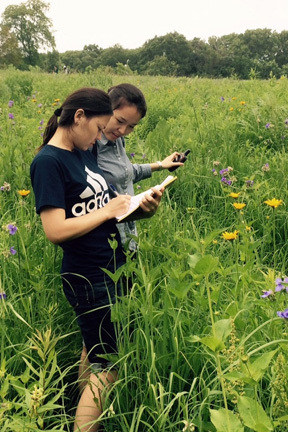 Students documenting pollinators in Biocore Prairie. Photo by Emily Greinwald. The request for proposals goes out after the first of the year. October 31: grant funds should be expended and a report submitted to Program Manager.